Do you think this is the future of mobile computing, or the past? You are here: Home » 2010 » August » Do you think this is the future of mobile computing, or the past? I came across this post at Mobile Health Computing, one of the many blogs of Dr. Joseph Kim. 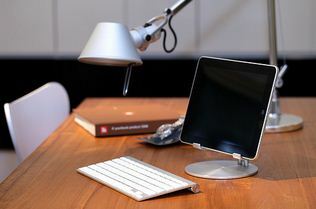 Here’s a great photo of an Apple iPad on a stand with a keyboard on the desk. Is this the future of mobile computing? Will we all end up using thin slate tablet computers that are held up on stands? While we’re sitting on a desk, we may use the keyboard. When it’s time to go, we grab the slate and we run off. No keyboard needed since we’re probably going to be computing on-the-go. The image from Dr. Kim’s post reminded me a similar setup I’ve seen in a pharmacy before. The image to the right is a J3400 tablet PC attached to the Motion FlexDock. 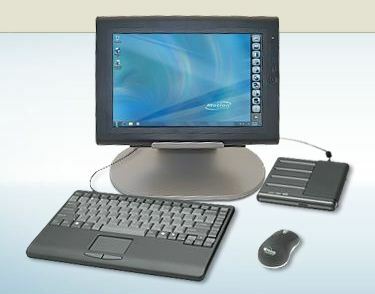 The FlexDock offers support for an external monitor, RJ45 nectwork connectivity and multiple USB ports for keyboard, mouse and printer. In addition the FlexDock includes a charging bay with room for an additional battery. Would it surprise you to learn that the setup to the right was introduced more than a year ago (early 2009), and that the J3400 is an “older” model tablet PC that was recently replaced by the J3500? I find that interesting. Either setup would be great.